Peruvian soldiers have been deployed near the Tia Maria copper mine after the deaths of a protester and a policeman over the past week. The government says the troops will "help maintain law and order" following weeks of violent protests. Local residents say the mine will ruin the environment and damage agriculture in the area if it becomes operational. The company, Southern Peru, says the mine will be compliant with the highest environmental standards. Local residents in the southern Arequipa region have opposed the mining project since 2009. A new set of protests began in March and three people have died since. 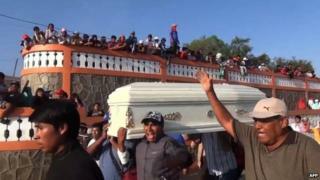 The latest fatalities are construction worker Henry Checlla, injured during clashes on Tuesday, and a policeman who died on Saturday after being hurt in a protest on Wednesday. The Peruvian government has not ruled out declaring a state of emergency in the southern province of Islay, where the copper reserves are located. "We haven't lost hope that dialogue is resumed. Meanwhile, we are taking measures to help maintain law and order," President Ollanta Humala said. The Mexican owned-company which has been given mining concessions in the Arequipa region of southern Peru, says it will invest approximately $1.4bn (£900m). "Tia Maria project will use state of the art technology which would be compliant with the highest international environmental and sustainable development standards," the company says on its website. The project was put on hold several times over environmental issues, but was given final approval last year.